Steaks grilling on the backyard barbecue is an iconic image of summer, but it's far from the only way to cook them. When winter comes around or when a sudden downpour makes outdoor cooking a trial rather than a pleasure, your oven can provide a practical alternative. Broiled steaks are very similar to their grilled counterparts and even baked steaks can brown nicely in a convection oven. Although your oven's broiler setting is visibly hotter than the usual baking settings, the difference between the two cooking methods goes deeper than that. When you use your oven to bake a loaf or roast a piece of meat, the food is cooked by the hot air circulating around your oven. Heat transferred by the air is part of the broiling process as well, but it's a minimal part. Most of the heating -- and especially browning -- comes from the radiant energy emitted by the element itself. It takes the form of infrared light -- the same kind of energy that can burn your skin on the beach at only 80 degrees Fahrenheit. To complicate matters further, some ovens make use of convection heating. They use a fan to actively blow the hot air around the oven rather than allowing it to circulate on its own. Good ovens even have a separate heating element to preheat the air before its blown into the oven. Fast-moving air heats your food more effectively than slow-moving air, because it forces the air molecules to press against the food. The forced hot air of the convection oven cooks the meat more quickly and also produces higher levels of browning at the surface of the meat. These browning reactions, called "Maillard reactions," can only begin once the surface moisture on the steak has evaporated. The fan speeds this process, quickly raising the steak's surface temperature to the 250 F minimum required for browning. Very thick steaks are best for baking, as they'll stay rare in the middle as the surfaces cook. 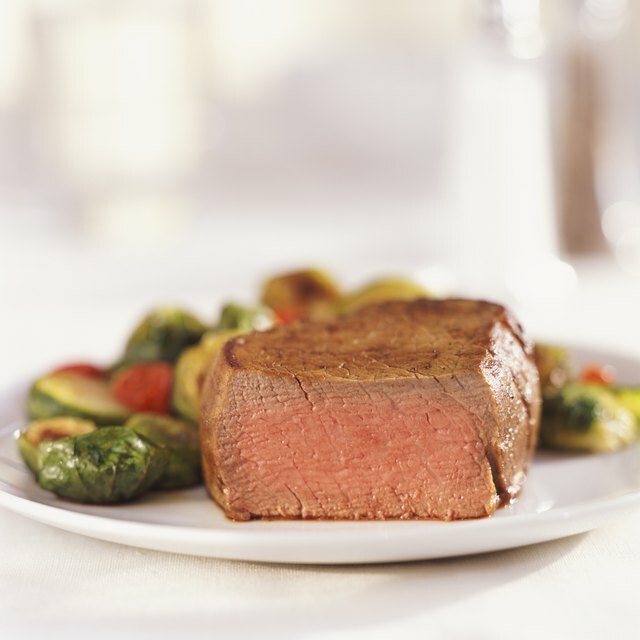 Convection makes relatively little difference when broiling steak in a convection oven, because the cooking is done primarily by infrared radiation from the broiler element. The moving air of your convection oven has little role to play and can actually be counterproductive. Steaks on the broiler tend to spatter fat and juices at the best of times and if you use the convection fan you'll simply spray the fat across more of your oven. With little benefit and at least one large drawback, there's no reason to use convection when broiling your steaks. Can I Bake Salmon Instead of Broiling It?